Erin Miller | Galion Inquirer Galion’s Jaden Ivy goes up for one of her kill attempts during Thursday’s conference match against the visiting Clear Fork Lady Colts. Ivy and the Lady Tigers would defeat Clear Fork in four sets to improve to 14-3 overall on the season. GALION — On Thursday evening, the Galion Lady Tigers volleyball team welcomed the visiting Clear Fork Lady Colts to town to compete in their Volley For The Cure game. 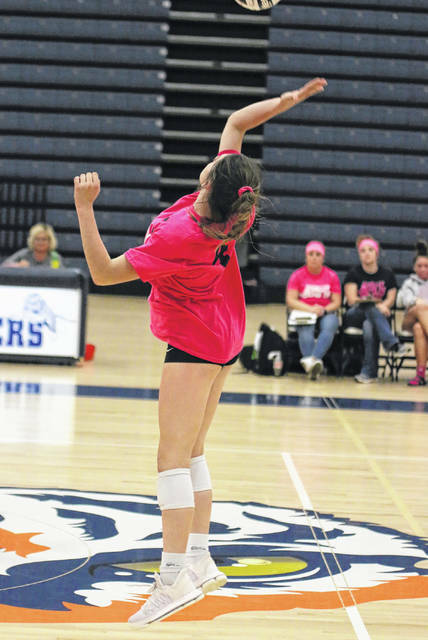 The annual contest honors survivors of cancer and sees both teams sporting pink uniform tops, in addition to raising money for the cause with bake sales, t-shirt sales and multiple raffles for area businesses. In the emotionally driven game, it would be the hometown Tigers holding on to defeat the Colts, despite a second-set serge by Clear Fork; 25-7, 19-25, 25-17, 25-9. With the victory, Galion improves to 14-3 overall with the victory and are now 10-1 within the Mid-Ohio Athletic Conference. Clear Fork falls to 4-14 on the season and 2-9 in conference play. The Tigers coasted in the first set, taking the lead from the beginning and only allowed the Colts within one point at the 4-3 mark. Galion would proceed to outscore their visitors to the tune of 21-3 to wrap the set and take the 1-0 advantage. Clear Fork, however, would come out in the second set looking like an entirely different team. The Lady Colts took their first lead of the night at 2-1 and, despite some back and forth play, would hold on to pick up their only set victory of the match; 25-19. Galion would be able to hold off the leftover Clear Fork push in the third to move ahead 2-1 after a 25-17 set win. The fourth set proved to be all Tigers as the home team held the Lady Colts under double figures for the second time on the night. The home team’s serving proved to be the difference maker in Thursday’s matchup, led by Kate Schieber. Schieber posted a total of 27 points off of the serve on a 33/33 performance which also netted her five aces on the contest. In the first set alone, Schieber rambled off 11 of those points, fueled by four of her five aces. Joining Schieber in the serving brigade was Nicole Thomas, recording 16 points on 20/21 serving with three aces. As a team, the Lady Tigers finished at a 87/94 serving clip that led to 61 points and 10 aces. Jaden Ivy picked up 1o points and an ace on 15/17 serving while teammates Kayla Hardy and Abby Foust notched four points apiece with Hardy netting an ace. Galion’s attack was led by Samantha Comer who finished with 22 of the 40 Tigers’ kills on the evening. Ivy threw down eight kills while Gillian Miller chipped in seven. Gracie Groves rounded out the kills category with three. Hardy was the primary ball handler on the net, racking up 36 of the team’s 37 assists on 120/121 setting. Foust earned the lone remaining assist for the blue and orange. Defensively, the Lady Tigers posted four solo blocks and four assisted blocks to notch a total of six as a team while also recording 55 digs on the contest. Comer provided a wall at the net for Galion, finishing the match with three total blocks. Brooklyn Cosey chimed in with two while Kerrigan Myers, Miller and Groves joined the block party with one block apiece. Thomas led the team in digs on the night, racking up a total of 21 to stall the Clear Fork offensive attack. Schieber also finished in double figures with 13. Ivy (8), Hardy (6) and Miller, Cosey and Foust added two digs apiece with Comer rounding out the defensive efforts of the Lady Tigers with one dig. A trio of road trips awaits Galion next week, starting with a trip to New Washington for a non-conference clash against the Buckeye Central Buckettes. The following day, the Tigers will head to Shelby for a meeting with the Lady Whippets before ending their week with a MOAC clash at Ontario on Thursday, October 4. MARION — On Tuesday, Galion beat Harding 25-13, 25-13, 25-10 to improve to 13-3 overall and 9-1 in the MOAC. As for Harding, they fall to 4-12 with the loss, including 1-8 within the conference. Schieber may not have earned an ace but picked up 13 total points on a perfect, 18/18 service performance to pace the Tigers. Samantha Comer led the ace party, earning six aces on 14/15 serving for 10 points. Other serving statistics for Galion were: Ivy- 13/14, 9 points, 2 aces; Hardy- 5/6, 4 points, 1 ace; Foust- 10/12, 8 points, 2 aces and Thomas- 8/9, 5 points, 2 aces. Comer, joined by Miller, were also the leaders of the Tigers’ attack, recording 10 kills apiece against the Prexies’ defense. As a team, Galion spiked 33 kills down on 73/88 hitting. Ivy turned in four of those kills while Myers and Hardy finished with three apiece. Groves (2) and Cosey (1) rounded out the Galion attack in the victory. Hardy earned all 28 of the Tigers’ assists on the evening on 77/79 setting. https://www.galioninquirer.com/wp-content/uploads/sites/38/2018/09/web1_IMG_8433.jpgErin Miller | Galion Inquirer Galion’s Jaden Ivy goes up for one of her kill attempts during Thursday’s conference match against the visiting Clear Fork Lady Colts. Ivy and the Lady Tigers would defeat Clear Fork in four sets to improve to 14-3 overall on the season.